We were saddened to learn about the passing of John Unrein, 65, from Riggins on July 2, 2017. John loved to drag race. He had a very potent motor built for his “Sandman Racing” Camaro. It delivered so much horsepower that at times, it would strike the tires as if he was in the burnout box. But he was never detoured nor discouraged. 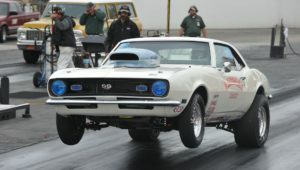 It motivated him to figure out a way to make all that horsepower stick to the ground with a small tire setup. 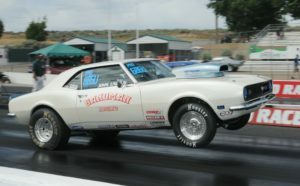 By later in the 2016 season, his Camaro was a hookin’ animal that was a quite a sight to watch launch from the Firebird starting line. When his bowtie hooked, it was a sight to behold. He would often carry the front wheels a foot or even two in the air from 60′ to often a hundred feet out from his launch. 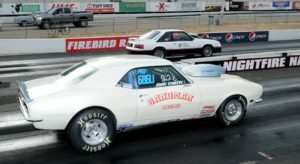 At first glance, it might have a looked like a car that felt more comfortable in the 10’s or even 11’s, but John punched out low 9-second elapsed times on a regular basis. We couldn’t have been more proud of him reaching the Firebird winner’s circle last Fall. He ran 9.26 on a 9.28 dial in to win the Trophy category on September 17, 2016 (pictured above). Earlier this year John was also instrumental in helping his brother secure his competition license with his beautiful Camaro. It was quite a gesture on his behalf to give up something he so dearly loved to do. For all of us who got to know and visit with John over the years, he was a man who let his race car do all the talking. He was always sincere, respectful and dedicated to the sport of drag racing. All of us at Firebird, including our entire New family and staff, send along our condolences to the entire family and friends of John Unrein. He will be missed. Bottom right photo provided by Robert Grice from Halloween Classic XXIII.